DESPUES DE LA PARTICIPACION EN EL DEBATE DEL PASADO MARTES 25 EL ING. 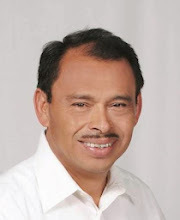 APOLINAR FLORES VELASQUEZ CONTINUO SU RECORRIDO POR EL MUNICIPIO AHORA POR LAS COLONIAS PUENTE BLANCO, MONTE SALAS Y SUS COLONIAS. LA VISITA DEL CANDIDATO FUE BIEN RECIBIDA EN LA RECTA FINAL DE LA CONTIENDA MISMOS QUE AGRADECIERON LA VISITA Y LA TRANSMISION DE LA PROPUESTA DE TRABAJO QUE CONTEMPLA INFRAESTRUCTURA, DESARROLLO Y PARTICIPACION CIUDADANA EN UN MARCO DE ESTRECHA COMUNICACION ENTRE EL GOBIERNO Y EL PUEBLO FORTINENSE. EL CANDIDATO APOLINAR FLORES Y SU PLANILLA HICIERON MERITOS E INVITARON A QUE ESTE 7 DE JULIO RAZONEN SU VOTO Y NO LO COMPROMETAN POR UNA DESPENSA, UN BULTO DE CEMENTO O UNA LAMINA, ESOS DADIVAS NO GARANTIZAN DE NINGUNA MANERA EL COMPROMISO DE LOS CANDIDATOS Y MAS BIEN COMPROMETEN POR TAMPOCO EL BIENESTAR PROPIO Y DE SUS FAMILIAS. LA APUESTA DEL PARTIDO DEL TRABAJO ES A FUTURO CON PROYECTOS DE LARGO ALCANCE QUE LLEGUEN Y TRAIGAN BENEFICIOS TANGIBLES INMEDIATOS A LA POBLACION COMO SON CREACION DE OPORTUNIDADES DE EMPLEO ATRAYENDO INVERSIONES QUE ADEMAS SE COMPROMETAN A RESPETAR LOS RECURSOS NATURALES Y AMBIENTALES ASI COMO IMPULSAR PROYECTOS PRODUCTIVOS DE LA PEQUEÑA EMPRESA PARA QUE PUEDAN SER NEGOCIOS EXITOSOS. ASI MISMO RESALTO ALGUNOS COMENTARIOS EN LAS REDES ACERCA DE SU PERSONA Y CONFIRMA A LA CIUDADANIA QUE APOLINAR FLORES VELASQUEZ Y SU PLANILLA PROVENIENTE DEL PARTIDO DEL TRABAJO NO SE REUNEN NI PACTAN O NEGOCIAN CON NINGUN PARTIDO POLITICO, POR CORRESPONDER A VISIONES TOTALMENTE OPUESTAS Y SIN COINCIDENCIA A LA PLANTEADA POR EL PT QUE COMO ANTECEDENTES ES EL UNICO PARTIDO QUE HA MOSTRADO CONGRUENCIA EN SUS POSTULADOS Y EN SU ACTUAR QUE COMO SE RECORDARA EN LOS ULTIMOS 12 AÑOS APOYO SIN RESERVA ALGUNA EL PROYECTO DE ANDRES MANUEL LOPEZ OBRADOR Y ESTA VEZ EN LOS TIEMPOS DE LAS ALIANZAS RECHAZO POR COMPLETO SUMARSE A CUALQUIER PROYECTO QUE PUDIERA PRESENTAR PROPUESTAS DE LA DERECHA REPRESENTADOS PRINCIPALMENTE POR EL PRI Y EL PAN POR INCOMPATIBILIDAD DE VISIONES.